Fr. a: max. p.L. 0.047, W. head 0.017 m Head squarish with rounded top and corners. Shank square in section. Fr. b: max.p.dim. 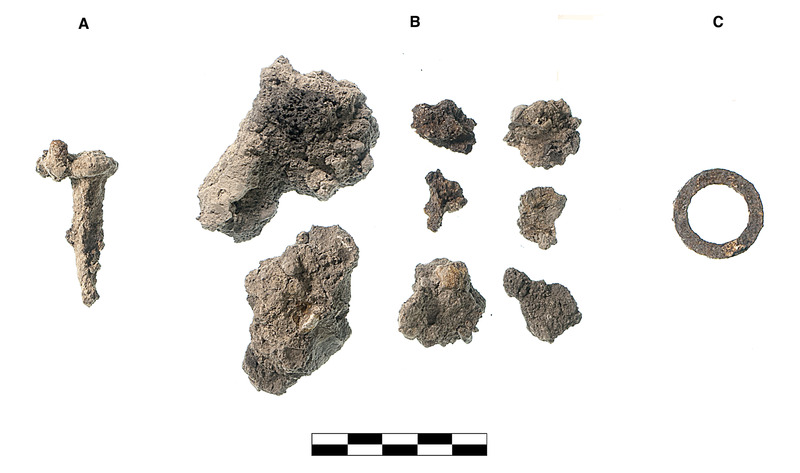 0.053 m. White mortar/plaster, some adhering to stone and small chunks of mortar, mostly charred white to gray. Fr. c: Diam. 0.027. Flat ring, machined: washer or gasket. Iron nail (a), heavy corrosion adhering to head, perhaps a small part of shank broken away near tip, otherwise intact; eight irregular fragments of burned mortar (b); and one iron modern iron gasket (c).